The Live Stock Reel System is often used for sheep, cattle or adult pigs. The big advantage of a reel system is it cuts down the time (and frustration) it takes to move a fence line. The Standard Live Stock Reel has a strong metal frame with an ABS reel. Adjustable over run brake to stop the drum from free wheeling and creating a knot. Ratchet lock allows you to make a line tight and then lock the drum in position. *Please note this is an approximate number. The reel has a drum lock, and a drag brake to help prevent drum over run. 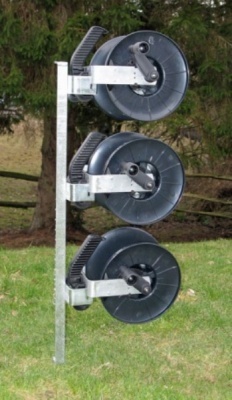 The reels seat in to strong galvanised steel mounts - once in they are securely held. The Steel post has a double spike so it can be easily pushed in and more importantly has a strong grip on the ground.